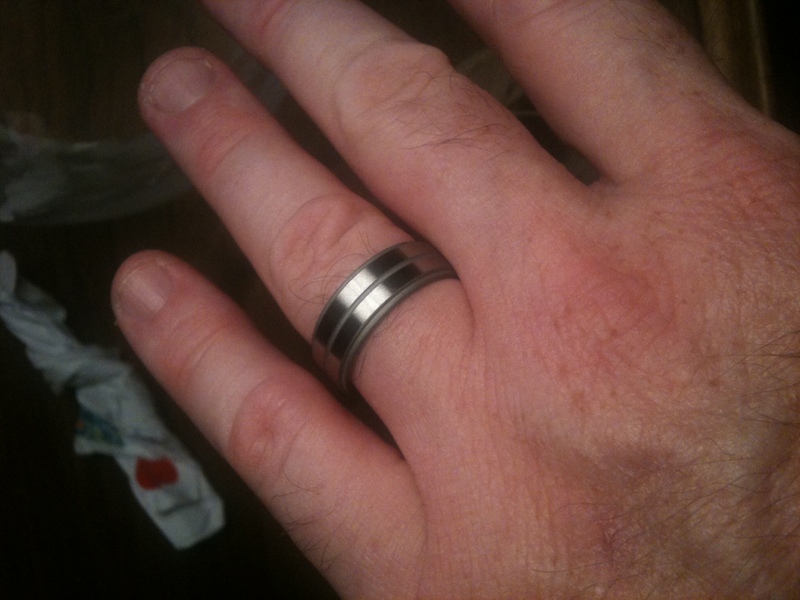 On a Tuesday night in late May, I was horrified to discover that my wedding ring was gone. I looked that night, even though it was almost midnight when I noticed it was gone. I looked for several days around the house. I even used a freaking metal detector to poke around in the yard. It was gone. And I was crushed. On a Monday night in late September, I was thrilled to open a small package that Mrs. Crappy gave me for our anniversary and find a new ring to occupy my left hand and ease the fretting I had done since May over the original. As we did with the first one, we sort of picked this one out together. I didn’t know she had started poking around on Etsy until she sent me a few links to rings and jewelers several weeks ago — and I was immediately drawn to this one, a beautiful double-banded titanium ring made by titaniumknights in Utah. I offered to buy it, but Mrs. Crappy said no, she would take care of it. And there it was, after we finished the anniversary dinner I made for us on Monday night. As I wrote back in May, I was concerned that a replacement ring — one that wasn’t the one that Mrs. Crappy put on my finger on Sept. 25, 1999 — would somehow be diminished, that it wouldn’t adequately represent either that day or the life we’ve had together since. But in the few days I’ve had to get used to having a real ring back on my finger, I’m thinking that’s not the case at all. There are things we’d both change about our wedding; I know I have a much better sense of who I am now — we both do — and one small representation of that is this ring. It feels a lot more like me than the plain band I wore for eleven and a half years. More importantly — it’s still about us and what we share. And that means my new ring is exactly what it should be. Aww. I just got kinda weepy! Congrats on the new ring. It looks great! Funny, isn’t it, the perspective time gives us regarding our wedding day? I look back and wish a couple things were different (primarily I wish we had recorded the damn ceremony, because it was beautiful), but the day itself pales in comparision to what we build over the years with our significant other. Anyhoo, glad you’ve got a ring to continue to remind you. As you well know, you Crappies are one of my favorite couples and two of my favorite people to come out of this social media stuff. Big hugs, and many more happy years. not much more i can say other than that, except i love this post. Next PostNext 2. the days between.